Spirits Burning - "Found In Nature" / "Alien Injection"
Here we have the lowdown on the third and fourth Spirits Burning CDs, Don Falcone's "gathering in space" of musicians from the global space rock community and beyond. These are NOT compilations! Don takes contributions from various musicians and brings it all together as producer, sometimes blending together submissions from 3 or more sources (Don explains it all in his own words in the interview that appears this issue). The first two Spirits Burning CDs were released by Gazul, a sub-label of Musea (see AI #'s 9 & 17). Found In Nature is the third CD and was released only recently by Italian based Mellow Records. In addition to Don, contributors include Daevid Allen, Michael Clare (University of Errors, Weird Biscuit Teatime), Graham Clark (Gong, Spacehead), Karen Anderson, Tom Dambly, Luis "Zero" Davila (Melting Euphoria, Fireclan), Paul Eggleston (Architectural Metaphor, Bionaut), Dave Falcone, Chris Green (Bionaut), Carl Howard (Nomuzic, Born to Go, Alien Planetscapes), Edward Huson (Quiet Celebration), Jerry Jeter, Rich Landar (King Black Acid), Pierce E. McDowell (Azigza), Mychael Merrill (Melting Euphoria, Fireclan), Gary Parra (Cartoon), Trey Sabatelli (Weird Biscuit Teatime), Pat O'Hearn Thomas (Mushroom), Purjah (Quiet Celebration), Judge Trev (I.C.U, Atom Gods), Paul Williams (Quarkspace, Church of Hed) and Randy Wilson (Netherworld) and several members of the Acid Mother's Temple gang. Quite a lineup, ay? There's a clear theme on the album as most of the tracks on Found In Nature are instrumental and to varying degrees in the ambient/atmospheric realm, though there's lots of variety and throughout the album you'll find all manner of space rock, progressive and electronica influences. There are 16 tracks but among the highlights is "Burning Bush", a groove laden slab of space jazz that will get your toes tappin' and hips shakin', though it also has its more dreamy ambient moments. "Dolmen" features cosmic atmospheric space rocking jazz and prog, with killer dual guitars from Daevid (credited with "heavy guitars") and Jerry Jeter (credited with "floating guitars"), and more body shaking grooves. "Darker Bows of Rain" is a dark combination of floating electronic space and freaky sounds. "Oak, Elm and Spruce" is a bit different. It's lead by Dave Falcone playing some beautiful acoustic guitar and backed by Mychael Merrill on djembe, Rich Landar on synths, Don on bass and keys and a nice flugelhorn bit from Tom Dambly. A very spacey meditative piece. "Ingredients… Pink Lady Lemonade… Liftoff…" includes the Acid Mother's Temple folks, among others, and as you can imagine it goes completely into orbit, though it's still very much in keeping with the atmospheric/ambient nature of the album. But across its 9+ minute length we're treated to some fun freaky ambience, atmospheric rock and cosmic prog. "Unrepaired Roads" is less than 2 minutes but packs a punch, being a very cool spaced out groove rocker with violin leads from Graham Clark. "Rakasasha-Loka" is another excellent freaky ambient space rocking groove tune. I love the combination of Daevid Allen gliss guitar and Graham Clark efx'd violin on "Streetsweeping Sauce", which goes great with the alien electronica grooves. "Wilder Beams of Moon" is a ripping space rock and ambient grooves tune. Daevid and Michael Clare do the rocking University of Errors bit while Tom Dambly, Mychael Merrill and Don add the grooves and electronica. A great combination. The rocking continues on The Ancient Structure, lead by Graham Clark on violin and Judge Trev on guitar. Wow, a killer space jazz jam. An excellent album and if you listen close you'll really get an appreciation for the role Don plays as producer, mixing and shaping the various parts into tracks that are simultaneously cohesive and wildly varied. 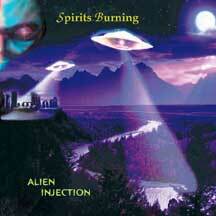 Not yet released at the time of writing (September 2006) but hopefully soon, is Alien Injection, the fourth Spirits Burning CD, which Black Widow will hopefully make available in the coming months. Some of the participants also appeared on Found In Nature, but we've got some new folks too. We've got Captain Black (Hawkwind, Spacehead), DarkSanttu, Michael Camaro and Yur Zappa from Dark Sun, Kev Ellis (Dr. Brown, Bubbledubble, Magick Cat), Michael Moorcock, members of San Francisco band Mushroom, Steve Palmer (Mooch, Blue Lily Commission), Peter Pavli (High Tide, Michael Moorcock's Deep Fix, Robert Calvert's "Hype"), Adrian Shaw (Hawkwind, Bevis Frond, Magic Muscle), Brian Tawn, Thom The World Poet, Paul Williams (Quarkspace, Church of Hed), Daevid Allen, a whole bunch of other people that were on Found In Nature, and… get this… Bridget Wishart. Yeah, Bridget Wishart who was Hawkwind vocalist on Space Bandits. And of course Don himself. Alien Injection is quite different from Found In Nature, being much heavier and including vocals on many of the tracks. Things begin on a hard driving space rock note with the title track, with Kev Ellis on vocals and backed by a powerful backing band including deep grooving bass from DarkSanttu, appropriate alien synths and classic prog mellotron from Don. What a great opening number! "New Religion" is next and is another strong track, with more powerful bottom end from Ade Shaw's bass, excellent vocals from Karen Anderson (whose congas also add a nice tribal groove to the song), gliss guitar embellishment from Daevid, and freaky electronics from Don. "Alpha Harmony" is a completely cosmic jamming space rocker with a nice bluesy edge and spoken word vocals from Thom The World Poet. Damn… nearly every track is a winner on this one and I'm tempted to go on at length on all of them, but I'll control myself and just describe a few of the other standouts so you'll get the idea. Anyway, "Augustus" starts off as a jazzy-proggy cosmic instrumental with a great electric/acoustic guitar combo from Doug Erickson and Dave Figoli, more tron from Don, and sax leads from Purjah (Quiet Celebration) that go beautifully with the mellotron lines. It flows along for a bit but then took me by surprise by launching into a killer space rock and prog jam. "Another World" and "Salome" are the tracks with Bridget on vocals and I think they turned out really good. "Another World" is deep in 70's styled progressive rock territory, with gorgeous tasteful guitar soloing from Steve Palmer and classic prog keyboard sounds from Don. And "Salome" is a tribal hippie psych song with an Amon Düül II flavor. "The Hawk" is another standout space rock and prog tune. It rocks hard in space and Jerry Jeter's guitar sounds like something off an album from the early 70's. This sucker ROCKS! Ditto for "Imported Serpents", on which Purjah switches to guitar and cranks out some of the most fiery licks on the album. "Upturned Dolphin" is an otherworldly piece, with Daevid on spoken word vocals, Graham Clark on violin and dual guitars from Jay Radford (electric) and Michael Moorcock (acoustic). We've also got a few tunes ("Every Gun Plays Its Own Tune", "The Entropy Tango", "Ingleborough") from Michael Moorcock's Deep Fix days, but with additional new material that makes for some interesting tracks. Overall this album really blew me away and is probably my favorite of the first four Spirits Burning albums. So big kudos to Don for producing two very different albums that are both in the Spirits Burning spirit. The two go together very nicely and hearing them back to back really emphasizes the breadth of space rock & progressive contributions Don has received and worked with. For lots of details about Spirits Burning CLICK HERE to read the interview with Don Falcone that appears in this issue. 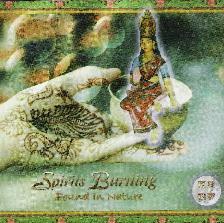 For more information you can visit the Spirits Burning web site at: http://www.nohpoetryrecords.com/sbmain.html. Visit the Mellow Records web site at: http://www.mellowrecords.com. Visit the Black Widow web site at: http://www.blackwidow.it.